Blog Teams Atletico Madrid Will Cech injury mean an early Chelsea return for Courtois? Will Cech injury mean an early Chelsea return for Courtois? Standing at the opposite end of the pitch, Thibaut Courtois will probably not have had a particularly good view of the injury sustained by Chelsea’s Peter Cech early in the Champions League semi-final at the Vicente Calderon stadium last night. If he had however, the young Belgian ‘keeper on loan at Atletico from the west London club, may well have turned his thoughts to the implications the event may have on where he will be plying his trade next year. The ‘dilemma’ for Chelsea of having two world-class goalkeepers on their books, albeit with one being a decade older than the other, has become a difficult circle to square for the club. Having a ready-made replacement lined up for Cech when the club deems it right to move him on seemed an ideal situation. The rapid progress of Courtois however to a level of performance where he is being hailed as the best goalkeeper in the world, has muddied the waters somewhat. With Cech still turning in outstanding displays, and at 31 still relatively young in goalkeeping terms, the timing hasn’t seemed right to look at succession issues just yet. With this in mind, Chelsea were minded to persuade the Belgian to extend his contract, currently due to expire in 2016 for a further two years, and then loan him back to Atletico for a final season. They would then bring him back to Stamford Bridge for a season of integration, before taking over the number one slot. 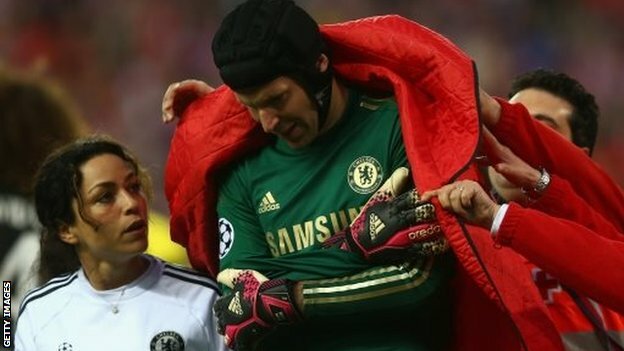 The injury to Cech may have changed all that however. A dislocated shoulder can be a worrying injury for any player, but for a goalkeeper it does of course take on a heightened level of concern. Depending on the seriousness of the dislocation, the injury may make it more likely for such problems to happen again. Suddenly, 31 may not seem so young any more, and with the thought that such injuries could seriously hamper, or even terminate a ‘keeper’s career at the top level, a potential crisis could be looming. It must therefore now be in Jose Morinho’s mind to consider the option of bringing forward that transition season by taking Courtois back to Stamford Bridge as Cech’s anointed successor this summer, and begin the process of winding down the career of the club’s stalwart stopper. The nightmare scenario would of course to be leaving Courtois in Madrid, excelling at his craft, and have Cech plagued with recurrences of the injury, relying on back-up ‘keepers, and having Chelsea’s season compromised. The summer will be a time for decisions at the Bridge on a number of players’ futures. Concerns about Cech however will inevitably be at the top end of Mourinho’s list of issues to resolve as he contemplates the best way forward. The speed of the goalkeeper’s convalescence may be a factor in any decision, but that may just hide any potential for the injury to recur. Having an outstanding goalkeeper is a key requirement for a successful season, and Mourinho will not want to risk falling short. That’s why Cech’s injury could mean Courtois bidding ‘Adios’ to Atletico at the end of the season.